In many ways, the November election is shaping up to be a fight between different visions of America's economy. 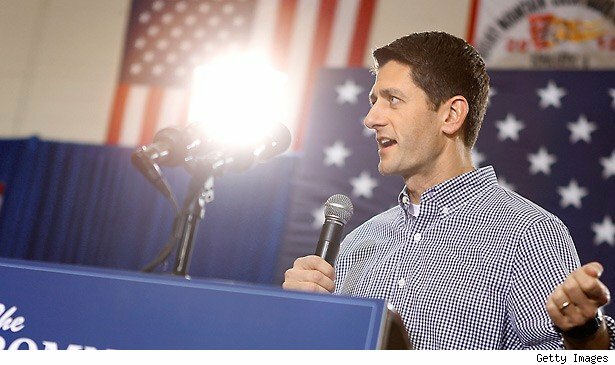 To prepare for the battle, the Republican party has lined up two of its biggest economic warriors: Mitt Romney, a former Wall Street money man, and Paul Ryan, the party's most famous number-cruncher. Together, the pair hopes to offer a sustainable, prosperous vision of the future, a "Path to Prosperity," to borrow the title of Congressman Ryan's famous budget proposal. While it is unclear how much of Ryan's proposal will ultimately be enacted if he and Romney win, there's no question that his suggestions for lower taxes and drastically scaled-back services has informed much of current Republican economic thought. What has been less discussed, however, is how his suggestion would affect the average middle class family -- and whether or not they would be better off in a Romney-Ryan America. Let's start with where we are right now. The average American household has 2.6 people and lives on just under $50,000 per year. Under the current tax code, it pays 10% of its income up to $17,400 and 15% of everything above that. After the standard deduction of $11,900, this comes to $4,845 in base taxes, not including exemptions and tax credits. Ryan's plan streamlines the tax code, condensing the current six tax brackets into just two: 10% and 25%. The plan doesn't specify where the cutoff line between the two brackets would lie, but it seems reasonable to expect that it would stay somewhere near where the 25% bracket currently hits in, at $70,700 for a married couple filing jointly. If that was the case, and if the standard deduction stayed the same, the average household would see an immediate drop in its base tax rate. A couple filing jointly would pay $3,810 -- a savings of $1,035 when compared to their base tax rate under the current code. While not the stunning $265,000 that the average millionaire household would save under the Ryan plan, it is nonetheless a nice chunk of change. Ryan's tax cuts for the wealthy would leave a big hole in the budget, but he argues that the shortfall could be filled by cutting some of the tax code's credits, exemptions and loopholes. 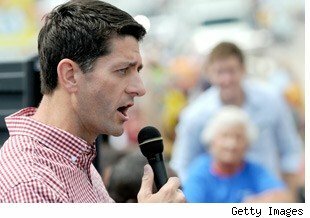 In a recent interview with Fox News' Britt Hume, Ryan claimed that this would primarily affect rich taxpayers: "What we're saying is get rid of special interest loopholes and deductions that are uniquely enjoyed by the wealthy so we can lower tax rates for everybody." In other words, Ryan claims that his plan would reduce tax breaks for the wealthy in order to cut taxes for the poor and middle class. Unfortunately, though, eliminating tax shelters and other upper-class tax benefits would barely make a dent in the massive revenue cuts Ryan is proposing. To fill that gap, the Bipartisan Policy Center recently pointed out, the tax code would need to eliminate nearly every exemption -- including those enjoyed by poor and middle class workers. These include dependent exemptions, child tax credit, education credits, mortgage deduction credits, and other exemptions that bring down the average family's total tax burden. With all exemptions and credits removed, that turns the $3,810 tax bill that Ryan's plan proposed as a net savings for you into a $2,160 tax hike. Admittedly, this is an extreme scenario. However, Ryan has said his tax code revision would be revenue neutral -- and based on his explanation of how to get us there, the only way the math adds up is if all our tax breaks get the ax. But even if a Ryan plan could be devised that preserved all the exemptions, deductions and credits the middle class enjoys today, his plan would still have a major impact on middle class finances. It calls for roughly $4 trillion in budget cuts over 10 years. Because big ticket items such as spending on Social Security, defense and interest on the national debt are protected, most of these cuts would come out of the one-third or so of the budget that's labelled "discretionary" programs. The Ryan budget talks about these cuts in very vague terms, but a veritable army of economists have devoted themselves to determining how they would actually play out. The general consensus is that most of the savings would come out of basic federal services. Washington Post reporter Brad Plumer has broken this down to a few simple numbers: Among other things, he argues that under a Ryan budget plan, transportation spending would be cut by 25%, assistance to the poor by 16%, and education and social services by 33%. These cuts would hit middle class families hard. In vague terms, they would translate into dozens of costly problems, including driving delays as road repairs are put off, food poisoning outbreaks as more food goes uninspected, and a thinner safety net during job layoffs and other emergencies. On a broader scale, it also seems likely that many families would have to increase spending on necessities like their children's education and car repairs as the quality of essential government services would plummet. Ryan's boldest plans have revolved around Medicare. His most recent proposal calls for insurance companies to make yearly bids, in which they would offer competitively-priced health care plans. The government, in return, would agree to fund the second-cheapest plan, and would allow retirees to enroll in it for free. For insurance over the level of that baseline plan, retirees would have to pay out of pocket. Ultimately, Ryan's economic plan might offer a slight tax break off the top for the middle class, but any savings would be wiped out by the loss of deductions and a big jump in the amount of money that taxpayers would have to spend to educate their children, fix their cars, deal with e. coli outbreaks, and handle all of the other services that the federal government would no longer provide. And, if anything was left over, they would be well-advised to set it aside for old age, when Ryan's proposal could leave them struggling to pay for health care. In other words, Ryan's tax cut is a great deal -- if you don't actually rely on the federal government for anything. The former speaker's 2010 return shows he earned $10,754 of tax-free interest, compared to $26,655 of the taxable variety. Romney's forms show just $557 of tax-free interest and $3,295,727 of taxable interest income. Even if you don't itemize deductions, you can write off alimony paid to an ex-spouse ... as long as you also include the ex's Social Security number so the IRScan make sure he or she reports the amount as taxable income. Gingrich fulfilled that requirement and deducted the $19,800 he paid his ex-wife in 2010. Tax law allows you to deduct the loss on a stock that becomes worthless, treating it as though you sold it for $0 at the end of the year in which it lost all value. That appears to have happened to at least one of Mitt Romney's investments. His return shows a $63,511 loss on shares in an investment fund that were disposed of for $0. Congress has created special rules for what it calls "passive activities," a group that includes most investments in real estate and limited-partnerships. Basically, losses from such investments can only be deducted against gains from similar activities. There's an exception that allows up to $25,000 of loss from rental real estate to be deducted if you are "actively" involved in the rental. We don't know if Gingrich is actively involved in the rental in Wisconsin, but even if he was, he would not have been permitted to deduct the $4,646 loss he reported. The $25,000 allowance gradually disappears as adjusted gross income moves between $100,000 and $150,000. With AGIof $3,142,066, Gingrich is out of luck. (He can stockpile the disallowed loss and deduct it when he sells the property.) By the way, the Romneys return shows that the passive loss rule blocked the deduction of over $2 million in losses from limited partnerships. The federal income tax is on a pay-as-you-earn system. If you don't pay in enough during the year -- via withholding from paychecks or estimated tax payments -- the IRSwill slap on an underpayment penalty. Generally, you avoid the penalty if your payments during the year are at least 90% of what you owe. Gingrich owed an extra $382,734 when he filed his $2010 return, 38% of his tax bill for the year. That triggered an underpayment penalty of $1,543. The opposite side of the coin from the underpayment penalty is paying in too much doing the year. About 75% of all taxpayers are in this boat, and get tax refunds every spring. We think that's silly, and have a calculator to help you match withholding from your paychecks to what you'll owe for the year. Our calculator won't help Romney, though, since he has no wages from which to withhold. He overpays via quarterly estimated tax payments, and boy does he overpay! His 2010 return shows that he paid in $1,609,441 more than the $3,009,766 that he owed. He didn't ask for a refund, though. He let the IRSkeep the cash as a down payment on his 2011 tax bill. A special rule allows qualifying self-employed workers to deduct 100% of their medical insurance premiums, even if they don't itemize deductions. That might have helped Romney, who reported that he paid $14,176 in self-employed health insurance premiums in 2010. But he didn't get the tax break. Rather than claim the special deduction, Romney reported the premiums as medical expense on Schedule A, where a deduction is allowed only to the extent such expenses exceed 7.5% of adjusted gross income. Romney's $14,176 of premiums fell well short of $1,623,488 (7.5% of his AGI).